Curious formations on the Spiti River at Kioto, Spiti. 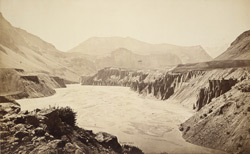 bl.uk > Online Gallery Home	> Online exhibitions	> Asia, Pacific and Africa Collections	> Curious formations on the Spiti River at Kioto, Spiti. Photograph of the corridor formed of ancient columns in the Qutub Minar complex, Delhi from the 'Strachey Collection of Indian Views', taken by Samuel Bourne in 1866. Situated at Upper Sutlej at a height of 10,000ft, it shows a view of curious gravel formations on the Lagudarsi Stream at Kioto, Spiti, the result of aerial degradation.